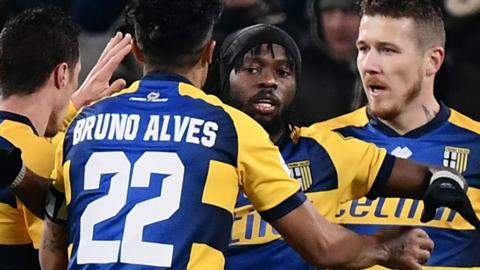 Former Arsenal forward Gervinho scores twice as Parma come from 3-1 down to earn a point at Serie A leaders Juventus. A Serie B game is halted five seconds after kick-off and then abandoned following a head injury to Lecce midfielder Manuel Scavone. Inter Milan's poor start to the season continues as Federico Dimarco scores a brilliant winner for Parma against his parent club. Mario Mandzukic and Blaise Matuidi give Juventus victory at Parma, with Cristiano Ronaldo still awaiting his first goal.